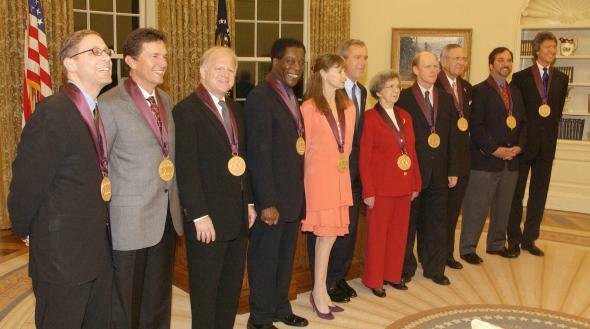 Rafe Esquith, second from right, poses for a photograph with other recipients of the 2003 National Endowment for the Arts award and President George W. Bush in the Oval Office. Yikes. Rafe Esquith—perhaps the most decorated elementary-school teacher in the country, the only K-12 educator ever to receive the National Medal of the Arts—has been accused of sexual misconduct in shocking documents released Tuesday by Los Angeles Unified School District. Until he was removed from the classroom this spring, Esquith, 61, had taught fifth grade at Hobart Elementary School, a high-poverty school in Los Angeles with an overwhelming percentage of English-language learners, for more than 30 years. Esquith’s “Hobart Shakespeareans” nonprofit, which puts on a Shakespeare production every year in his classroom, became world-renowned, the subject of a PBS documentary, and a resplendent example of the miracles that committed public educators can work even in challenging school environments. When he wasn’t transforming young lives, Esquith was writing inspirational books and accepting lots of awards: In addition to the National Medal of the Arts, his prizes include Oprah Winfrey’s Use Your Life Award, Disney’s National Outstanding Teacher of the Year award, and even Dalai Lama’s Compassion in Action Award. He has been dismissed for murky reasons that appear to be part of a witch hunt against hundreds of other L.A. educators … the result of L.A. school leaders losing touch with reality after being traumatized by a molestation scandal a few years ago. But now, with the 66-page document dump, those reasons no longer seem so murky. While Esquith has not been charged with a crime (though the documents do allege that, even before he became a teacher, Esquith fondled several children in the 1970s), he comes across as a desperate, preening, pathetic predator: the last person you want near your kids. He’s accused of spanking, fondling, and tickling female students; making grossly inappropriate comments (saying, for example, that one student “loved green M&M’s because they made her horny”); and screening movies with sexually inappropriate content to fifth-graders after school. The conversations include one in which the girl thanks him for giving her lunch money and “for the hundreds and hundreds” he’s given her. Before the documents became public, Esquith’s lawyer accused the school district of constructing a “fraudulent narrative” as part of its “latest effort to smear.” In October, Esquith filed a $1 billion class-action lawsuit on behalf of approximately 2,000 LAUSD teachers who were removed from the classroom for no clear reason—part of an age-discrimination scheme, the suit alleged, to place pressure on teachers approaching retirement age to resign without the full pension and benefits they’d earned. We’ll see how that one works out. *Correction, Dec. 9, 2015: This post originally misspelled Jay Mathews’ last name.